In this section of our Outdoor Insects Month guide, you will be introduced to several facts pertaining to the American wasp. Wasps are actually considered to be highly beneficial insects; however, their ability to sting results in their being labeled a “pest”. These outdoor insects may become a nuisance in the late summer and early autumn months because they have the uncanny ability to interfere with and disrupt outdoor activities in which people commonly take part. It is common for individuals to refer to the American wasp as a “bee” due to its ability to sting. In addition to this, wasps live in colonies that are similar to those that bees live; however, wasps are not bees and bees are not wasps. The American wasp behaves and looks much different than the bee. It is imperative for individuals to know the difference between these outdoor pests in case an infestation occurs. Wasp extermination is much different than bee extermination. Continue reading for important facts pertaining to the American wasp. The wasp has a relatively slender body, complete with a narrow waist. The skin appears to be both smooth and shiny. The legs of these outdoor insects are cylindrical. The wasps that are most encountered by individuals within the United States are yellow jackets, paper wasps, and baldfaced hornets. The American wasp is considered to be a predator. These outdoor insects typically feed on other types of insects, as well as arthropods. 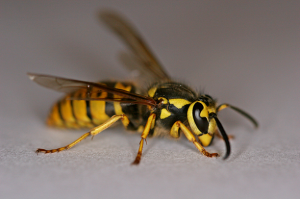 This is the main reason why wasps are considered to be highly beneficial in the environment. The most common pests that are consumed by wasps include the caterpillar, the cricket, flies, and pests that are similar in nature. Is the American Wasp Dangerous? If you are reading this guide, it is quite likely that you or someone you know has had an unfavorable run in with a wasp, or you want to avoid this type of meeting. Wasps may pose a danger to humans if they elect to sting. Not only is the sting painful, but, it could result in a potentially life threatening allergic reaction in those that are sensitive. These reasons are why so many people elect to learn as much as possible about wasp extermination. In the late summer and early autumn months, the queen of the colony will stop laying eggs and the nests of the American wasp will start to decline. The insects will then change their techniques in regards to food gathering. At this time, wasps seek out sweet foods and carbohydrates. When these insects encounter human foods, they may start to show signs of aggression. This is the time when they are most active around people and pose the largest danger to people.